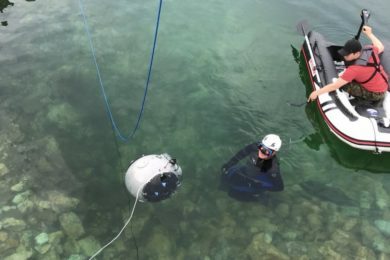 From the 11th to the 22nd of June, the UNEXMIN technical teams were in Finland for the first field trials with the UX-1A robot in a real life environment. The Kaatiala feldspar mine, where the trial was held, is an open-pit flooded mine with few underground tunnels, perfect to test the robot’s capabilities. The first week of working, started with the last dry tests with the robot, as a preparation for the first real swim. All the subsystems, including ballast system, SLS, thrusters, IMU, multibeam-sonar and computer control were tested during this week on shallow waters of 2 to 5 m deep. The week finished with autonomous motion and navigation tests, essential competences for the proposed line of work. On the second week the working station was moved to the deeper part of the Kaatiala lake where the underground tunnels are located. Here, multiple dives with the robot were done, where UX-1A entered and navigated the underground tunnels. The robot’s capabilities such as autonomy, navigation, control, and mapping were all successfully tested. UX-1A’s movement and control abilities were mainly tested by making it pass through underground tunnels with junctions, focusing on the robot’s autonomy. After a couple of tests in the underground part of the mine, the overall trial was over. After the success that were these first trials, the UNEXMIN team will now continue working to further develop the technology, specially the autonomy part and to optimise it for the exploration and mapping of flooded mines. Data will be analysed, with tailored post-processing tools, and UX-1’s capabilities will be improved for the next trials at the Idrija mercury mine in Slovenia.